If Jeff Nesbit’s POISON TEA: How Big Oil and Big Tobacco Invented the Tea Party and Captured the GOP (Thomas Dunne/St. Martin’s, $25.99),about the vast sums poured into Tea Party cisterns by tobacco and oil companies, feels dated just now, it’s only because both Trump and Sanders have harnessed public disgust with those corruptions and against the politicians so easily bought and paid for. One didn’t have to be a Trumpist to enjoy the downfall of the Wisconsin governor Scott Walker, the handpicked favorite of the Koch brothers. Nesbit, who once worked for Vice President Dan Quayle, has seen politics from both sides. Charles Koch, he warns, “learns from his mistakes, refines operations and advances forward relentlessly in pursuit of singular goals.” Nesbit offers a refresher course in Civics 101: While we fixate on the presidency, statehouses remain the incubators of a great deal of the bad policies that affect the way we live. A chapter on a Minnesota town’s law against public smoking is a tiny seminar on the mechanics of ­influence-peddling — complete with libertarian alarms that outdoor-­smoking bans would diminish our cherished “personal freedoms” to kill ourselves and others with cancer. Jeff Nesbit’s “Peace” ‏(Summerside Press, 369 pages, $15, paperback‏) is a thriller that envisions how the world could arrive at the brink of all-out war in the wake of an exchange of fire between Israel and Iran. After one of its drones identifies a secret, normally idle Iranian uranium-enrichment site as having gone online, Israel destroys the facility, and uses the opportunity to take out a number of other sites as well. This elicits not only a series of Iranian retaliations against both Israel and the United States, but also sets off a cascade of other military and political actions, by Russia, North Korea, Venezuela, Hezbollah and others, that quickly and very convincingly lead to a situation of global economic chaos and the threat of catastrophic warfare. The book receives added value by introducing several young characters who, though not in positions of power, are able, through a combination of idealism and innovative creativity, to appreciably affect events for the better. One of them is Nash Lee, the creator of a digital texting service similar to Twitter that enables people to get messages out to the entire world via their cell phones. When we meet him, he is in Malawi, where he’s testing out a diagnostic medical clinic for the field that is wired into a network, but can be stored in a backpack. What Nesbit, 53, calls the “relentless positive storm” made possible by revolutionary communications technology is one of the factors that he believes has the potential to save humanity from itself. An Indiana native, Nesbit has worked in Washington, D.C., for most of his adult life, first as a journalist and then on the other side of the aisle, as a spokesman for Vice President Dan Quayle and for the Food and Drug Administration, and in a private firm. He now serves as director of legislative and public affairs with the National Science Foundation. Nesbit is also a believing Christian, and he published “Peace” with an “inspirational” press. The book, though, does not have a clear political bias, nor does it present the threat of nuclear apocalypse as necessary or theologically ordained: “Peace” doesn’t feature a Second Coming or the Rapture. Nesbit wants to preach the need for nations of the world to communicate with each other, and for individuals faced with monumental dilemmas to follow the “still small voice” that will speak to them if they only listen. Haaretz spoke with Jeff Nesbit by telephone, from his home outside Washington, D.C. When I contacted you to arrange this conversation, you told me to call today, because your wife and son would be away in Malawi. That’s also the home, of course, of one of your book’s most interesting characters, Nash. What’s with you and Malawi? The family connection with Malawi began with my daughter, Elizabeth, who when she was finishing high school said she wanted to go to Africa “to help.” I started looking for someplace safe for her and my wife, who’s a physical therapist, to go. Through connections I found a rural hospital − St. Gabriel’s, 60 kilometers from Lilongwe in central Malawi − that took them both for the summer. That was five years ago. St. Gabriel’s has essentially adopted our family, and we return there as often as we can. My oldest son, Josh, started a nonprofit called FrontlineSMS: Medic, based on a pilot project with 100 rural villages he connected to St. Gabriel’s during the summer of his junior year at Stanford. My youngest son, Daniel, right now is using his Thanksgiving break at Carnegie Mellon to launch a new project to connect mothers with disabled children in rural villages to a clinic in central Lilongwe. My wife, Casey, is helping the University of Malawi develop the first-ever physical therapy degree program in the country. FrontlineSMS: Medic, which allows simple text messages from cell phones to create a communications network and hub, is now running projects in 12 countries. Normally, when we write each other in SMS, our messages are not saved or preserved beyond each mobile device. With this software, you can create a database to preserve and catalog the incoming text messages. This creates a communications network out of the simple SMS text message. Josh also used the same system based on text messages to coordinate an emergency response system in Haiti, which handled 100,000 emergency text messages after the earthquake there, and now he’s developing a system to help the citizens of Colombia track the location of landmines throughout the countryside. These are all SMS-based, one-to-many systems. Was that something like the portable clinic that another character in “Peace” pioneered? No, that was my daughter, Elizabeth. The medical clinic-in-a-backpack project that she helped create at Rice University was recognized nationally by the Clinton Global Initiative. Elizabeth will start medical school next year. Your book defies expectations in a number of ways. Whom are you trying to reach, and what would you say is the book’s message? A year and a half ago, I just realized that I wanted to write about the situation between Iran, the United States and Israel − to look at the underlying military, economic and religious conflicts. I tried to do the impossible: to write a book that could be read by anyone, and understood by anyone, both traditional religious audiences and secular ones, and readers on both the left and the right. As I took on each character, I was highly sympathetic to that character. When I wrote about the character I call Sa’id Nouradeen, who is a surrogate for the head of Hezbollah in southern Lebanon, I tried to be sympathetic to him and view the world as he does. In fact, you do quite a good job of helping us understand the motivations of each character and how they see things. I’m happy that you recognized that in the book. If I could speak with Mr. Netanyahu and others, I would encourage them to find a way to speak directly to Iran’s leadership. I did a lot of research, and it became evident to me that a confrontation was inevitable between Israel and Iran. Peace is possible again between Israel and Iran − but only if they speak to each other. I believe it’s important to understand Iran’s underlying motivation, which is to be recognized as an emerging regional superpower, mostly an economic superpower. Political and economic sanctions are not likely to deter Iran from its nuclear aspirations. There’s a lot going on in this book. What theme do you feel is most important? At the highest level, the book is saying that leaders of nation-states speak for those nation-states and their actions are important. That’s why the conclusion of the book, whether it’s realistic or not, is that you need to reach across and speak directly to your enemy. It’s a principle I feel we might be missing. For example, today there’s a peace that is waiting to happen on the Korean peninsula. It was there at the conclusion of the Korean war. But it requires speaking directly with your enemy. That’s one aspect of the book. A second point though − I think you see the phrase the “relentless positive storm” four times in the book. This is a phrase I use to characterize both how one person can change and remake the world, and the defining characteristic of the next generation of potential leaders currently in their 20s and 30s. There is a new generation of kids coming up who are intuitive, indirect, inquiry-based learners. They’re comfortable going all over the world to learn something, in order to bring back an answer. I’m really hopeful that they will remake our world. Older leaders haven’t yet recognized that kids who have learned in that generation are poised to make big things happen − that it’s a different generation, with different motivations. I’ve created characters that might be minor in other books, but here are fearless about stepping up with solutions. I use that for folks, of any faith, who hear God’s voice. There’s a pivotal chapter in “Peace,” in which Nash sits and listens calmly as an African pastor essentially delivers a personal sermon to him, and tells him what it means to be the “salt of the earth.” That’s a key phrase. Someone can be a world leader or can be 25 years old, and they can make a difference. In my own life, I believe that. I started talking about taking on the tobacco industry when I was in my 20s. I was that guy − the one who convinced David Kessler and the FDA to regulate cigarettes in the U.S. The chaotic situation that develops in your book presents the opportunity for a number of big political moves, including the introduction by the Americans of a radical new peace plan to the Israelis and Palestinians. Where did that plan come from, and do you see it as having serious potential? Through a whole series of discussions, we went through the Old Testament, and I tied that to the original discussion about the UN plan. I recognize that it may not be realistic. But, in order for there to be − I believe − a workable two-state solution, there has to a viable, workable Palestinian state, without Jerusalem as its capital − one that isn’t based on two geographically distinct pieces of territory being connected by an underground superhighway. It would require recognition by Jordan and Egypt that Jerusalem won’t be the capital of a Palestinian state. I don’t know if that’s possible − but I do know that it’s never happened, having one city as the capital of two states. Be’er Sheva was initially the capital of Palestine [under the terms of the Partition]. People have forgotten that. What seems unrealistic is that you’re imagining Israel getting everything north of Be’er Sheva, and the Palestinian state getting all the desert. That’s what people said about the United States once − that if you got beyond the Appalachian Mountains, people couldn’t live. With technology, you can do all sorts of things. I’m talking about the construction of a second city in Be’er Sheva, what it might look like. And in the second book in the series, “Oil,” I’ve begun to explore David Ben-Gurion’s dream of developing southern Israel and the Negev. If Gaza and the western coastline of Israel were connected to Be’er Sheva as part of a continuous Palestinian land − and the United States helped with land development and technology − anything might be possible. In this first book in the Principalities and Powers series, Israel has just attacked Iran’s nuclear facilities, triggering a chain of potentially cataclysmic events around the planet. Will leaders and the "salt of the earth" - great and small - be able to intervene before events spin out of control? Nash Lee, an NGO entrepreneur, is determined to make a difference through his worldwide ivillage network. Kim Grace, a nuclear scientist imprisoned in North Korea’s secret Camp 16, knows the truth about the devastating technology she helped develop. Anshel Gould, the brilliant chief of staff at the White House, has created a radical peace plan based on the long-forgotten UN proposal for Palestine after the Second World War. But is there a way to stop what seems unstoppable? What Iran, Israel, North Korea, and other earthly principalities and powers decide next could lead to global confrontation. . . .
Based on extensive research about the coming global conflicts surrounding Israel and the leaders who will shortly play important roles in those conflicts, the Principalities & Powers series also confronts the biggest issue facing the Christian church today—its historical role as the "salt of the earth," preserving the planet from corruption at critical moments in world history. In the back of the book there’s a Q & A section with the author that will make your hair stand at attention, make your heart race and will also bring the reader to their knees at the urgency to pray for peace in Israel. I’m thankful to have received a review copy of such a timely book. Through the interview, one realizes just how real most of the events in Peace are and some are happening right now. The author says, “At no other time in history have the stakes been so high. Individuals and nations-states contend for power and control of the earth, and Israel is at the very center struggle.” Jeff Nesbit has been a national journalist for many years. Who better to write Peace and give us an insight through eyes that have been in the very locations he describes. Jeff pens a master chess match with very powerful pieces on this board of life, playing a dangerous game, with all its members racing to take over the world. There is no do-over button in this game...only massive destruction. The author answers questions such as "Is a Fisson-Fusion-Fission Doomsday bomb like the one in the novel built by North Korea – really possible?" Unfortunately, it is possible…..
"Is Iran, in fact, building secret uranium-enrichment facilities inside revolutionary guard compounds throughout Iran?" Yes, in at least one instance…. "Is it really possible to develop a world wide text-message network with data bases, media and messaging that work even in repressive, totalitarian countries?" Yes, absolutely…. When I look at the map inside the book I’m always amazed at the size of Israel and the fighting that’s gone on there. Alas, this is a Holy war and the fight is against principalities and powers, not flesh and blood! It’s a fascinating and scary read when you realize most of the information in this book is real and/or close to happening soon. This a book you can’t rush through or you’ll be lost. The author marks the beginning of each chapter so the reader knows where this chapter will take place. I had to stay focused in order to grasp all the author wanted to share. I’m not a history buff nor do I daily keep up with current events, so I struggled a little and consulted my husband, who is on top of current affairs, to verify many points in this book that didn’t seem real to me. But to my dismay, they were. Jeff Nesbit was a national journalist and the director of public affairs in Washington, D.C. He sees and understands the global picture, has seen and experienced far more than he’s put in this book I’m sure and explains the big picture of world events in a very unique and interesting way. This is the first book in the series...oh, my, buckle up your seat belt and get ready for his second book. I’m sure it will prove to be just as enlightening and make the reader realize that through technology the planet is a very small place; there are eyes and ears tracking information everywhere! It also showed me that we need to pray for those in authority, that they can decipher this information and determine what is “real”. That is the rub! A Page-Turner You Can't Afford to Miss! Imagine a Joel Rosenberg and Tom Clancy collaboration, add intensity, and you have Jeff Nesbit'sPeace. Using stealth bombers purchased from America, the Israeli Air Force attacks Iran. The Islamic populations around the world are outraged while internationally Fundamentalist Christians and Jews rejoice. Western governments' fear what the crisis will bring, but cannot stop the tsunami. AS expected by many, the attack places the world on the brink of World War III. Time is running out and a peaceful solution increasingly looks unlikely. A small group of people is the last hope to prevent the pandemic destruction of global conflict. These brave souls think the only way to prevent war is to talk directly with the so called enemy; to achieve this requires a cell phone. The first "Principalities and Powers" global thriller is a superb tale that takes the audience inside of some nasty places as well as top secret locales. Fast-paced from the onset readers are hooked with the action that seems plausible as Jeff Nesbit uses headlines to guide the tale. Although the ending seems off kilter with the foot suddenly not putting the pedal to the metal after speeding from one international hot spot to another, fans will appreciate this realistic twisting doomsday clock countdown. An expert in the nonfiction Israeli and nuclear matters, Nesbit pens a riveting tale of action, power, greed and faith. Peace is a real thought-provoking and faith-filled read, especially in light of contemporary world situations. Book two in the Principalities and Powers series picks up where Peace left off. Again, Nesbit’s careful research gives readers not only a startling fictional story but also a tremendous amount of information about what is happening in the world right now. Compelling writing makes this a must- read for those who love suspense and contemporary world events. Just what do you think would happen if all the countries that supply us with oil, suddenly found their supplies at risk? There has been talk lately of the recent natural gas find in Israel and some believe that oil may lie within that country as well. If it were in fact true, Israel would move to the top of the super power list for supplying not only natural gas but oil as well. However, if that were to happen then the countries that have become Israel's biggest enemies would really find ways to destroy and wipe her off the face of the map as so many countries have already stated their threats. 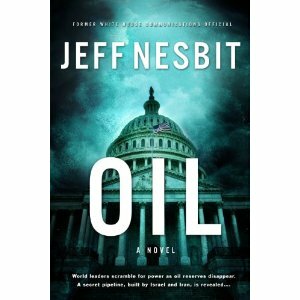 Now in the latest novel by Jeff Nesbit, Oil: A Novel, set this up as the underlying premise of this story. Iran, Iraq, Russia, Saudi Arabia, North Korea and China have a vital stake in trying to vie for the top position as an oil supplier to the world. The main problem with finding oil has been its difficult extraction for the shale in which it is located. Environmentalists want to make sure that the land and resources are not harmed and when a process is discovered that will allow that to happen, everyone wants a piece of the shale. Now power begins to shift by those that want it the most and using the legends from the Middle East of the prophecy regarding the Twelfth Imam and the Mahdi, they will make sure that all signs point to the rise of these figures and shift the balance of power in the Middle East forever. Now whatever peace has been achieved up to this point will now be placed on the table and what role will Israel have in it all? I received this book compliments of Summerside Press and Guideposts for my honest review. Even though the story takes awhile to develop you eventually understand why it's necessary when you see how detailed the process is by the climax of the book. There are many players involved in making this storyline happen and I think Jeff Nesbit does a wonderful job at building up his characters. It appears that a sequel is forthcoming as the book does leave the reader at a bit of a cliff hanger ending and things are not quite resolved. I would rate this book a 4.5 out of 5 stars and look forward to any future books that Jeff will breath life into. For those that love a bit of mystery and suspense with potential current world events then this one is perfect for you. Jeff Nesbit in his new book, “Oil” Book Two in the Principalities and Powers series published by Guideposts gives us another adventure with Nash Lee. From the back cover: Global powers race to exploit the chaos that has erupted overnight.